"Were you not able to keep vigil with me for one hour?" If you have a really good friend, or if you are married, then you know what it takes to be in a relationship with someone, two of the most important things you can do to deepen your friendship is to spend time together, and to talk with each other frequently. The best friend we can have is Jesus Christ - yet we may have a feeling that we don’t really know who Jesus is, or we don’t feel like we have a personal relationship with Him. 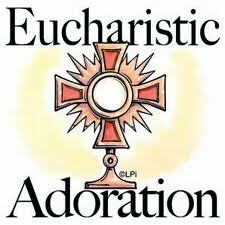 Eucharistic Adoration is the best way we have on this earth to spend time in quiet conversation with Jesus. You’ll recall that just before Jesus physically left the apostles and ascended to the Father, he reassured them, "And behold, I am with you always, until the end of the age." (Matthew 28:20) This statement is fulfilled in the reality of Jesus’ Real Presence in the Eucharist, right before our very eyes, in Eucharistic Adoration. Exposition of the Blessed Sacrament occurs in our Church every First Friday of the month and there are times when no one is scheduled to be with Jesus, especially around the Noon hour.